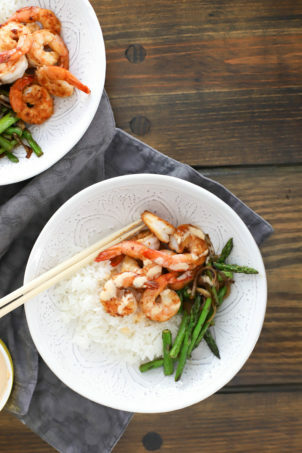 I mean, could there be a more appropriate springy recipe? I’m thinking no, but this one isn’t trying too hard with excessive amounts of green stuff. Or any green stuff, really. It is, however, a super simple snack/appetizer/side dish that happens to be VEGAN and takes all of 20 minutes to make. 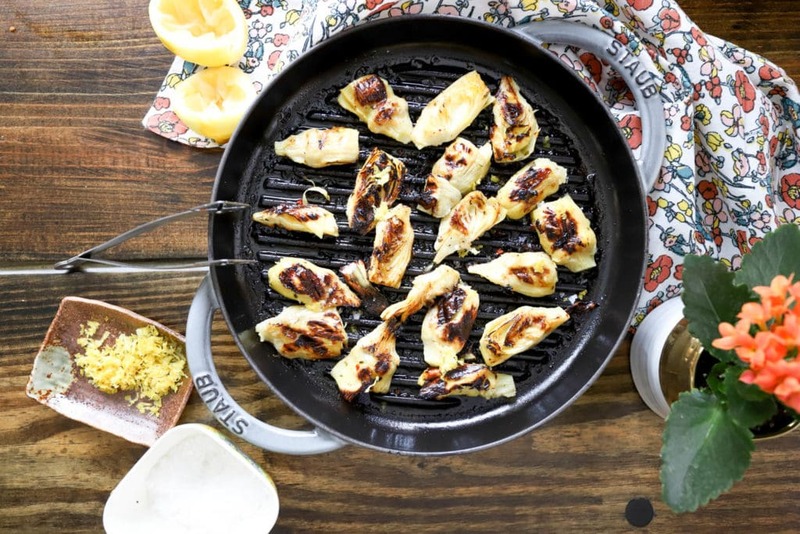 It is also full of flavor and texture and just feels like warm-weather with the help of an indoor grill because our grill is under the house out of the way of the never-ending construction. 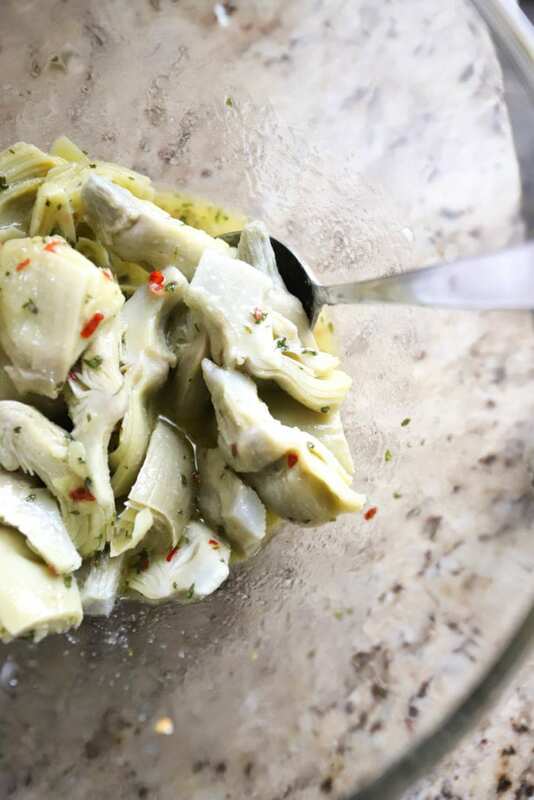 I love marinated artichokes straight out of a jar, especially on cheese plates or as a snack before dinner with nuts/wine, etc. We recently went to a new Italian restaurant in town and their antipasto platter had something similar to these: artichokes that tasted tangy and marinated and familiar but that were charred on the outside and served warm. I loved them (and ate them all, Jay can go either way on artichokes); the contrast of the tangy marinade and charred grilled bits was so good. HOWEVER, when I decided to make them there was no way in hell I was going to mess with a gazillion fresh artichokes even though they are in season. Trimming and choking fresh artichokes takes forever and I always find myself injured. 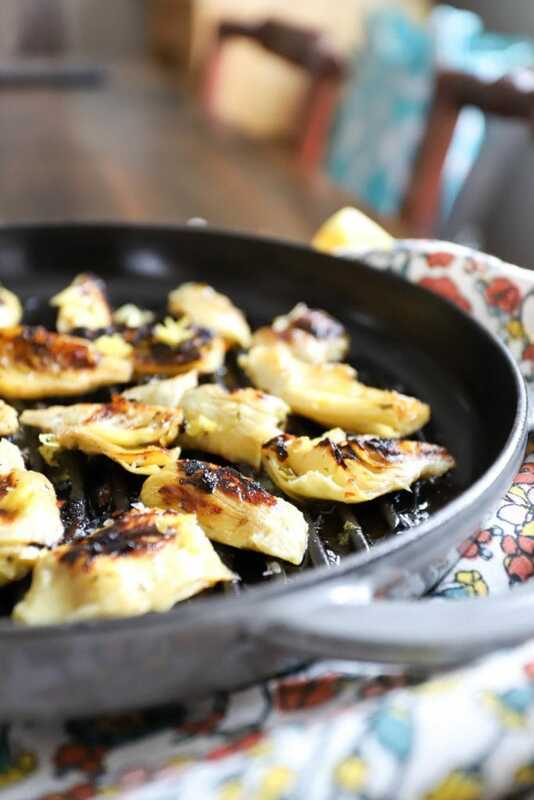 Plus, Trader Joe’s has frozen artichokes, so the texture is a little more firm than a jarred version and they hold up really well on the grill. So! 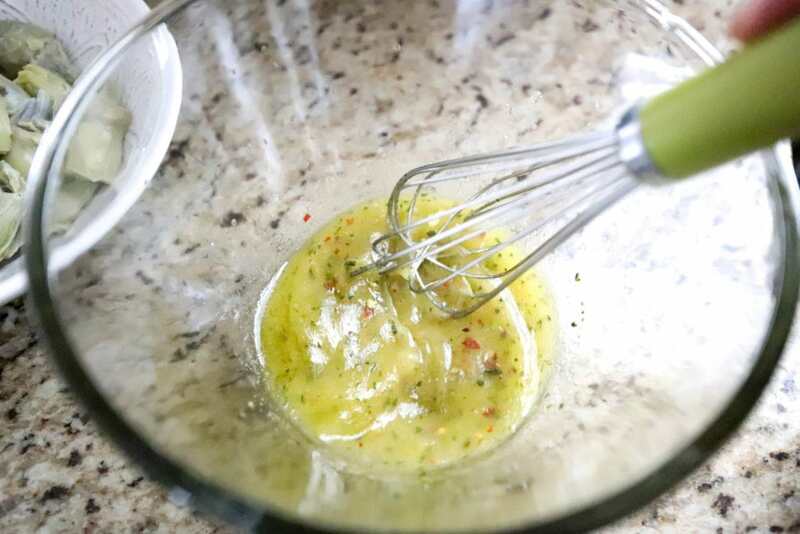 We make a super quick marinade. You can do this the day before or right before grilling, the flavor is great no matter what. A few minutes on the grill just for some blackening, and then we serve hot, warm, room temperature, or cold after a day or two in the fridge. 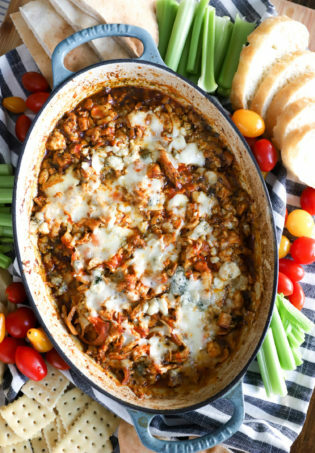 There is no wrong way to serve these, and I’d suggest making a massive batch because extra things to go with wine and cheese is not a bad thing ever. See also: Easter brunch/lunch. I used a package of frozen artichokes and just microwaved them for a minute to thaw them out. The marinade is super easy, lemon juice and olive oil with garlic powder, onion powder, crushed red pepper, dried parsley, and salt. 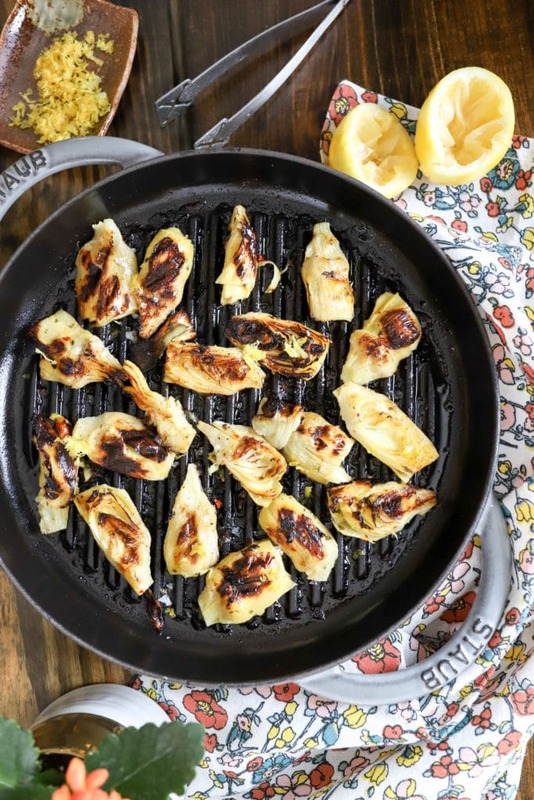 Before you add the lemon juice to the marinade, zest one or both lemons and save the lemon zest for topping the grilled artichokes, then whisk the dressing together. Taste it, and add a bit more salt if you’d like. 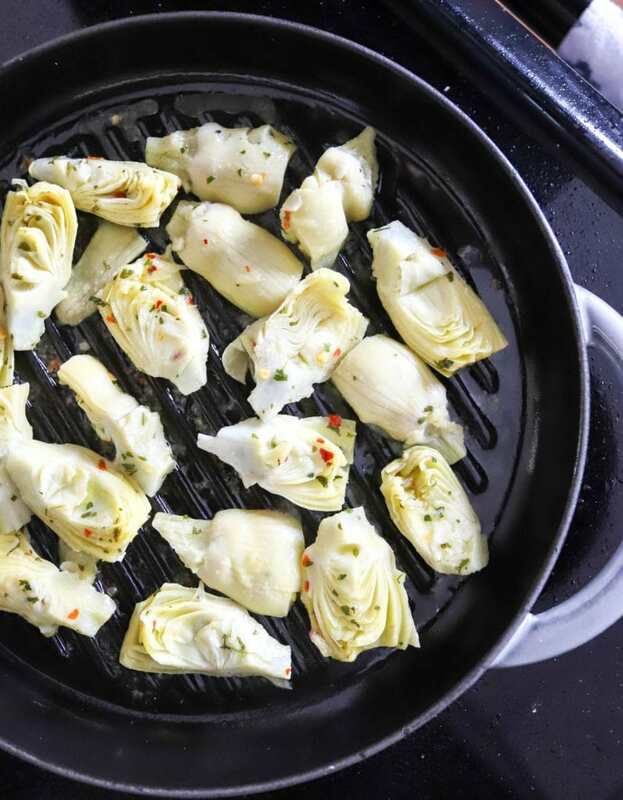 Add the artichokes to the marinade and let them sit for a minute or two while you preheat a grill pan to medium-high heat. 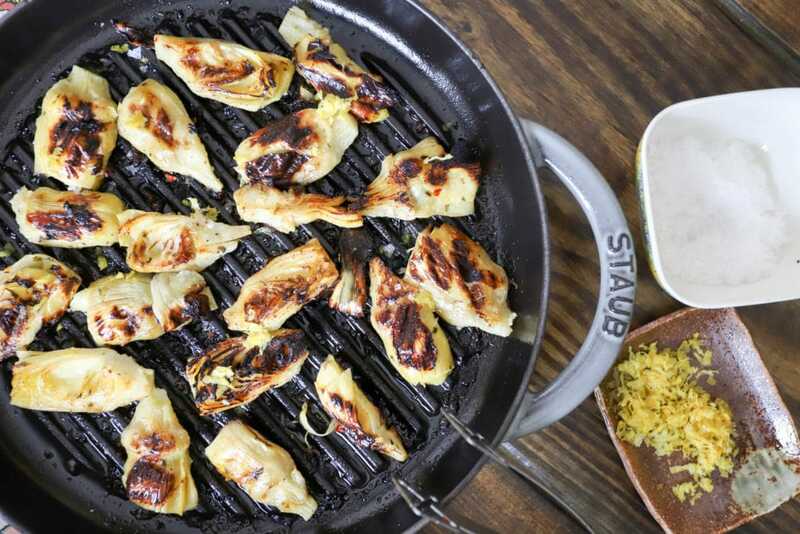 You can also grill these on a regular outdoor grill, but depending on the size they might be hard to keep on the grates, so I’d use a vegetable basket or similar to keep them manageable. 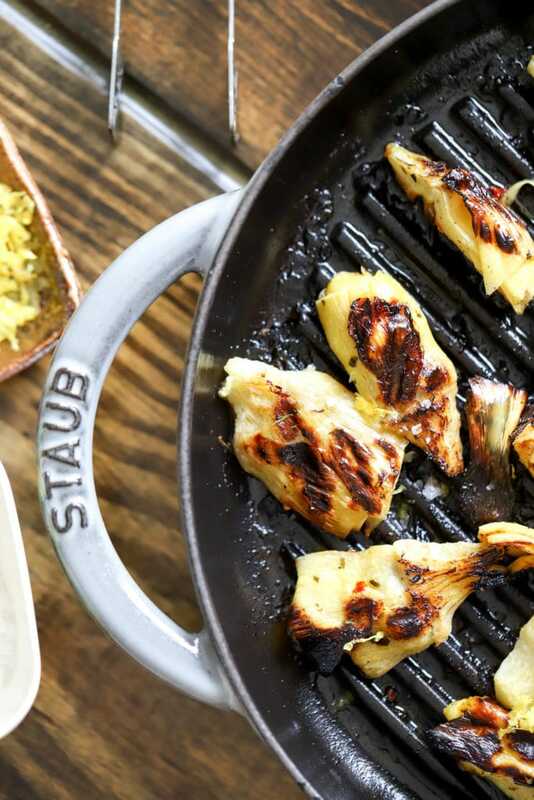 When the grill is hot, add the artichokes and let them sizzle! Some of the liquid will evaporate and then the chokes will start to get a nice sear on them. Mine took about 5 minutes on the first side and 3 minutes on the second side. 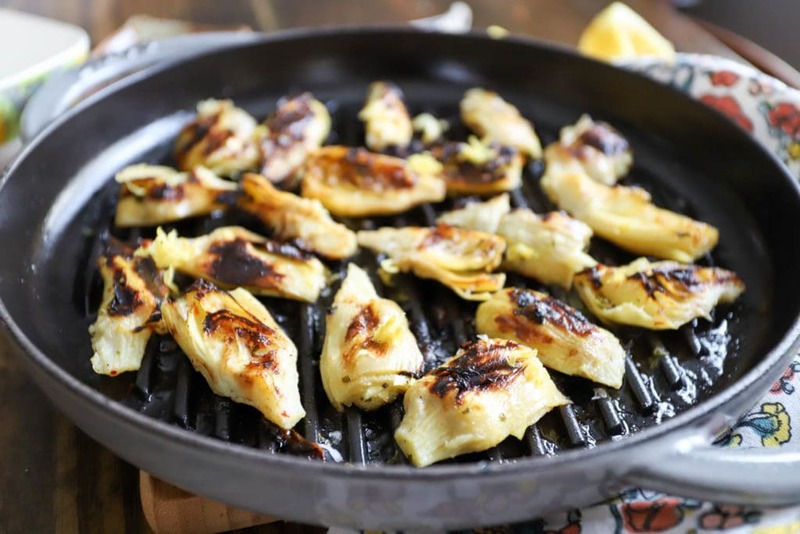 Check one or two artichokes for grill marks, and flip them when they are dark on the first side, then let them grill on the second side. When the artichokes are marked all over, they’re done! Sprinkle them with lemon zest and some extra salt and go to town. These are so simple, and the possibilities for what to do with them are just endless. 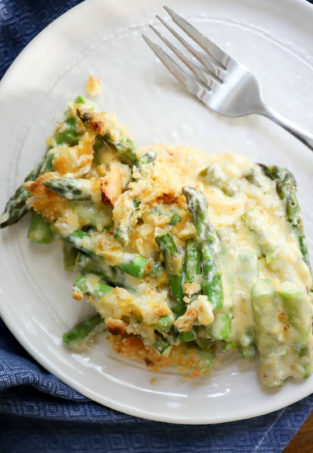 They go so nicely on a bread/cheese plate, but are also great as a side dish or topper with fish or chicken. Beck likes them just as a part of her lunch because why not, and they’re super delicious on top of a salad as well. Try these this weekend for your Easter feast, and make them all spring and summer long! They just scream eat-me-outside-with-rose. In a bowl, whisk together the lemon juice, olive oil, and spices. Add the artichokes and let sit for a few minutes. 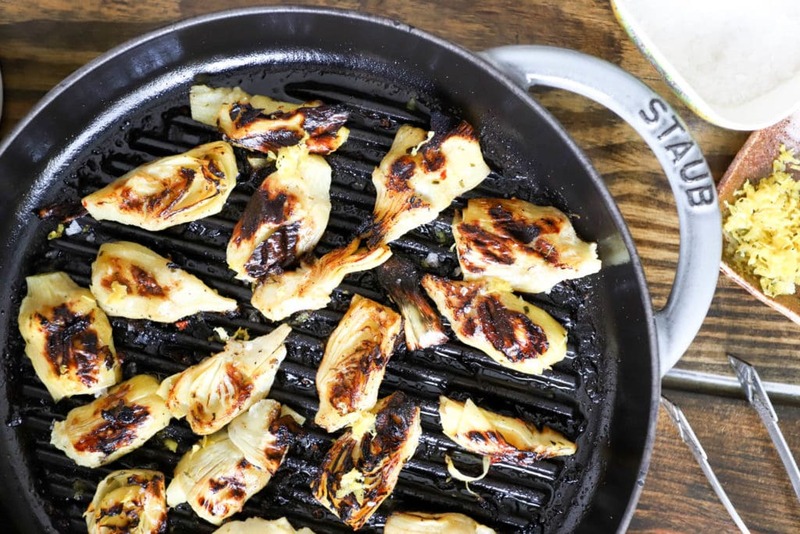 While the artichokes are sitting in the dressing, preheat a grill pan to medium-high heat. 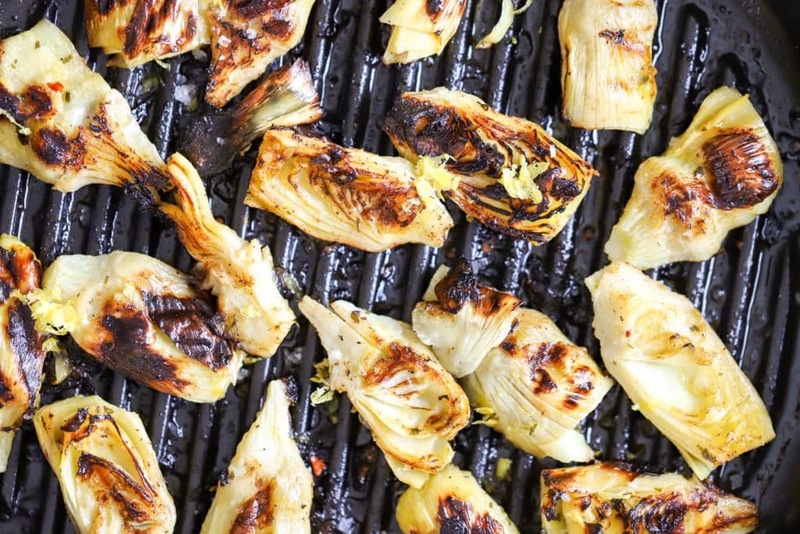 When the grill is hot, grill the artichokes for about 5 minutes on each side or until well marked by the grill. Remove from the heat and sprinkle with the lemon zest and a few pinches of extra salt. 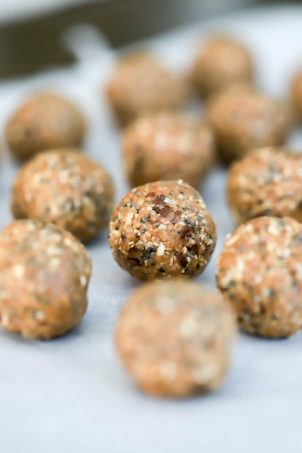 These are great served at any temperature, and will keep in the fridge for several days. Serving options: with an antipasto or bread/cheese platter, on top of salads, as a snack, or over fish or chicken for dinner. 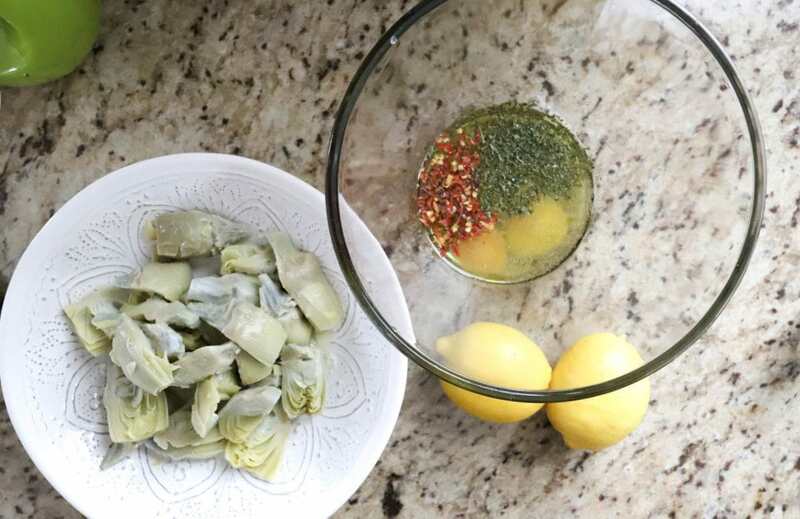 If you can't find frozen artichokes, jarred or canned is fine, just buy the kind without any marinade (packed in water) and drain them well before marinating them in the dressing.